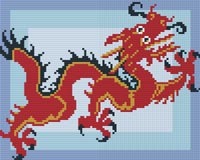 Dragon - 4 Baseplate Pixelhobby Kit. Copyright of www.crosstitch.com. All rights reserved.